We just received this photo from a very happy client who just finished building a new home in St. Helena Island, near Beaufort, SC. 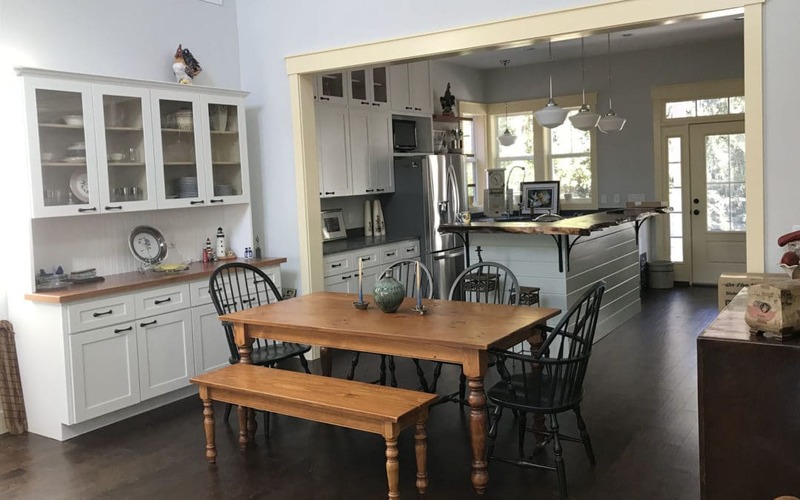 We love how his space came together, complete with live edge bar, mixed with shiplap, and our 6’x3′ Pine Carolina Farm Table with Old English legs. The set he chose included a matching bench and Winthrop Windsor chairs, painted black, to really pop in his home and add character. As he said, “The dining set is GORGEOUS!!!! Thank you so much for everything, your professionalism, your artistry and your service from initial phone call to delivery and set up. I have never worked with an organization as incredible as yours!” We are honored to be able to create beautiful dining sets that bring a room together and make a house a home. Even better is providing clients with our exceptional service, from beginning to end! Cheers!